In The Italian Girl, it struck me, as it did last time I read Iris Murdoch’s fiction, that the writer she brings most to mind is Flaubert. Both deliberately adopt narrative techniques to slide between the voice of the narrator and lead character, but what brings them closer together is the sense we are watching the action from outside of the window. Unlike her contemporary Brigid Brophy, who breathes life into her characters so effortlessly their traces ghost around one’s library for months, Murdoch never seems to climb inside, preferring to be the puppeteer, choreographing the protagonists to explore her theories of power. Perhaps better than Flaubert is a comparison with Edward Hopper, whose characters give us room to fill a space with sweet and grievous yearnings. Whereas the basic material of The Italian Girl is little different from innumerable fictional family dramas—that complex relationship between an adult and his or her mother—Murdoch’s extravagant vortex of characters subverts a tired trope into something more grand. The distancing and near contempt for these characters is enhanced by Murdoch’s use of satirical chapter headings. The projected distance of looking at her characters through a window in this way intensifies their sense of loneliness and paralysis. There is an intensity to The Italian Girl that compels me to dip deeper into Murdoch’s fiction. Perhaps next I’ll turn to the longer The Sea, The Sea. Notes on Stendhal, via Sebald, Beckett et al. Sebald chooses soldier, lover and would-be writer Marie-Henri Beyle to open the first section of Vertigo. He never mentions him by his better known pen-name Stendhal, nor does he reveal that his ‘essay’ and photographs are drawn from Stendhal’s fictionalised autobiography La Vie de Henri Brulard. 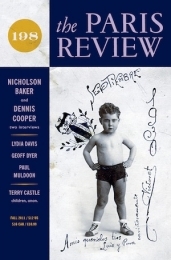 This corking issue of the Paris Review features not only the Geoff Dyer excerpt of his next book on Tarkovsky’s Stalker, but also a brilliant essay by Lydia Davis, Some Notes on Translation and on Madame Bovary. The concreteness of their word for (our Latinate) multiplication: Einmaleins (=”one-times-one”). The economy or condensation of their Wildbachbrücke (=’wild-brook’bridge”) = bridge over a mountain stream). One of my favourites is a word I remember from a Peter Handke novel but cannot now find in it, search as I may. I find it elsewhere, though, in an article about a 5,300-year-old corpse preserved by a glacier and discovered in the Alps by a Bersteigerhepaar (=”mountain-climbing-married-couple”). There are book bloggers I admire for their unfaltering dedication to a premeditated sequence of reading. Though I enjoy planning my reading, impulse often overtakes my carefully nurtured plans. This post is a corrective for me, an attempt to continue to read with some premeditation. Next year I plan to complete my immersion into Saul Bellow’s novels, read my unread Virginia Woolf novels and more of her diaries and essays, and read more deeply of Kafka’s non fiction. Also on my list is to sample more deeply the works of Cynthia Ozick, Thomas Bernhard, Robert Walser, Marguerite Duras and Peter Handke. I’m musing with trying once again to sustain a reading of Robert Musil’s The Man Without Qualities. Somewhere in the back of my mind I’m also thinking it is time to reread Proust and Anthony Powell’s A Dance to the Music of Time, but we shall see. I hope also to discover a new writer or two from my Reading the Girls List. My plan next year is to read a lot more Woolf. I expect also to immerse myself into the literary output of Coetzee, Flaubert, Kafka and Bellow, each of whom, to different degrees, I am mildly obsessed with at present. In my twenties and thirties I read (and in some cases understood) much more philosophy, and I intend to read more in this area this year, particularly keen to reread Kierkegaard. Of poetry, my ambition is to read Anne Carson more deeply and to tackle Wallace Stevens. It is with Dangling Man I will start my Bellow immersion in the autumn. Inspired by Bibliographing’s Melville project, my intention is to read the fifteen novels, short stories, essay collection and Bellow’s memoir. The year started as planned with some Kafka and Duras, but Simone de Beauvoir has commandeered my attention. Not just her writing but a posthumous influence that is leading me towards André Gide, Alain-Fournier, Henri Bergson and a rereading of Sartre. Along the way, I have adopted a desire to read all Nabokov’s novels and to tackle some Muriel Spark. There are also some choices of The Wolves that tempt me, starting with February’s Our Horses in Egyptby Rosalind Belben. It’s been a memorable year in my reading life, more concentrated than most years. The high points have been extraordinary, the lows few and forgettable. The unexpected revelation of my year are the novels, letters, essays and diaries of Virginia Woolf. After the thrilling discovery of A Writer’s Diary, The Waves, Mrs. Dalloway and the climax of my year’s reading To the Lighthouse, I intend to read much more of her writing. My thanks to Frances for the motivation to tackle Woolf. I’ve been slowly acquiring decent editions of Woolf’s diaries and plan to start on these next year, dipping into the other novels, essays and letters as the mood suits. Reading (and rereading) more deeply into a writer’s output, over a few months, is proving more satisfying than my recently acquired habit of flitting from author to author. My other fictional landmark of this year is undoubtedly Ulysses. My reading began as a provocation and ended as an unveiling. That a novel can capture the agony and beauty of life so coherently shook me, continues to agitate me. It is a book I dip into weekly. Finnegans Wake has replaced Ulysses as a delayed, taxing challenge, but not one I wish to accept at the moment. My only Joycean plan for next year is to read Richard Ellmann’s Biography. The third in the trio of books that set my head on fire this year is What Ever Happened to Modernism? Offering a personal perspective on literature and Modernism, Josipovici enabled me to understand why some forms and styles of novel electrify me and others leave me still hungry, or worse, nauseous. Other books that left an indelible mark during the year were Coetzee’s trilogy of fictionalised memoirs, Leigh Fermor’s short but very beautiful A Time to Keep Silence, Yiyun Li’s The Vagrants, John Williams’ brilliant Stoner, Josipovici’s The Singer on the Shore and Andrei Codrescu’s The Poetry Lesson. Don Quixote, of course, is also sublime but that will not be news to any serious readers. Revisiting Kafka this year, unbelievably reading The Trial for the first time, and now slowly digesting the Collected Stories and Diaries, occupy a different cavity than everything mentioned above. His writing is the ‘axe for the frozen sea’ inside me. Uniquely this year, there is only one book that I completed (though several I threw aside after fifty pages) that I regret, Michael Cunningham’s The Hours. Out of a misplaced love of Mrs. Dalloway I finished the book but cannot reclaim the hours I devoted to this execrable book.